Our national treasures are being vandalized and destroyed. At this time last year, two former Utah Boy Scout troop filmed themselves in October gleefully pushing over a 200-million-year-old goblin sandstone formation in a state park. 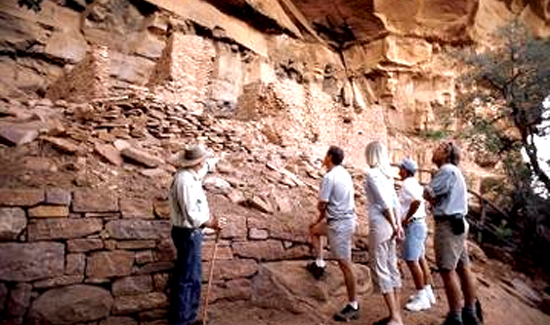 U.S. Forest Service Law Enforcement and Investigation on the Red Rock Ranger District, in Flagstaff, Arizona, is seeking information concerning vandalism to an archaeological site known as Jordan Cave near the Jordan Trailhead parking lot in Sedona. On Dec. 16, 2014, several individuals in Jordan Cave were seen removing and throwing rocks from the walls of the site over a steep embankment. Some of the rocks were also dug from the prehistoric floor of the site and were thrown over the embankment. Law Enforcement is trying to identify and locate the individuals in the attached photo who might be able to assist in the investigation regarding the vandalism. It is illegal to excavate, remove, damage, alter or deface any archaeological resource, to include surface collecting. An archaeological resource is defined as any historic or prehistoric object or resource that is 50 years or older. These acts of vandalism and theft to protected sites are found under the Archaeological Resource Protection Act of 1979, under Title 36 Code of Federal Regulations 261.9(g), which makes it a criminal violation under federal law. The severity of the crime ranges from a Class B Misdemeanor, which is six months in jail and a $5,000 fine, to a felony, which is one year in jail and/or $20,000 fine. Anyone with information regarding this vandalism should contact Officer Mike O’Neil at 928-203-7512.